Tom Gildea, a friend, a help, an ex Postal (did you say postal??) Worker waited a long time to get this bike and make it what it is today. 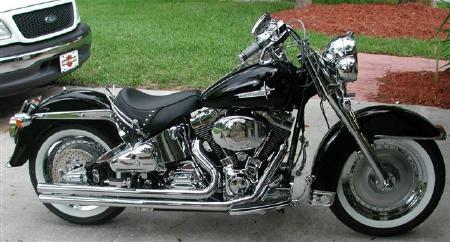 A 2000 FatBoy, it's reminiscent of the early 60's, with it's wide whites and Chrome tool boxes. Everything that should be Black is ('Paint it Black -- Thanks Mick!) and EVERYTHING else is Chromed!!! The Mustang seat has a Kuryakan seat rail around it... Samson Pipes make the noise and Chromed Fat Boy Wheels hold onto the rubber. If you want to know how to care for a bike, ask Tommy... This baby is immaculate! !